Action Ministries Houston now has a special way to raise money for the ministry. We have our very own hand lotion bar! Made of natural beeswax, vitamin E and a custom blend of natural oils, they are formed into a bar that will seal moisture in your skin while allowing it to breathe. 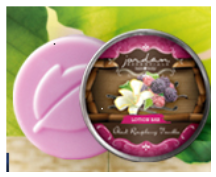 Available in Black Raspberry Vanilla, this unique bar can be kept in your desk or carried in your purse. AND, it will repel mosquitoes! Price: $7 each. Call the office at (281) 464-0774 to order. Many of us now do a lot of shopping on line. Now you can help AMH when you shop many of the large companies, including E-Bay. It is quite simple to do. There is a button at our website: www.actionministrieshouston.org. Click on that button and it will take you to the site where you can choose the various on line shopping companies that will give a percentage of your purchase to Action Ministries. Take a look and then remember Action Ministries Houston when you shop. How many times have you been in Office Depot to make a purchase and they ask if you have a Rewards Card. Now you can answer and definite “YES”. When they ask for a phone number give the number of the Action Ministries office: 281-464-0774. Again, a portion of your purchase will turn into money for Action Ministries and we will get coupons to buy our office products. Just another way to help us help others. Don’t forget to continue using your Kroger’s card when you purchase your groceries and gasoline. We receive a check 4 times a year from Kroger’s because of your purchases. Don’t have a card? Contact us and Pat will see to it that you get one. Another way to help is also at the grocery store. Many times a store has items on sale “10 for $10.” Why not give one of the ten items to AMH? Fill a sack or a box and then give us a call to make arrangements for delivery. This could also apply when you go to the famous dollar store!